The WA Rangelands covers around 85 per cent (2,266,000 km2) of the WA State’s land mass, and 75 per cent of the coastline. To strategically guide future investment over the next five years, Rangelands NRM has identified priority areas at the subregional level (Kimberley, Pilbara, Gascoyne, Murchison, Goldfields-Nullarbor and the Desert). In 2014, we developed priority areas using a 5-year time (from 2014-18 inclusive) to ensure a proactive approach to achieving outcomes which were both realistic and focused. By providing a baseline on which to focus future opportunities, Rangelands NRM is acknowledging the political landscape, a dynamic environment with climatic extremes and our diverse population base. As time has passed, more recently (2017) priority areas have been updated and defined by having significant environmental assets, manageable threats and the willingness of a community to collaborate and be engaged, demonstrating strong leadership and having a sustainable vision for the area. In 2014, we believed the areas shown on the map (left) gave Rangelands NRM the best opportunity to capitalise on funding opportunities given the existing level of engagement and capacity, the variety of assets and dispersed geographical locations. Priority areas as identified are not in response to any particular funding program, rather they reflect what is needed in the region to conserve special environmental areas, nurture enthusiasm and involvement and address threats affecting environmental assets. Rangelands NRM does not expect to fund every asset in the priory areas (nor the area per se), rather the priority areas provide scope to be selective when choosing preferred projects within the subregions. The brown patches on the map (left) represent priority areas 2014-2016. A whole of landscape approach was adopted to promote collaborations and partnerships which address threats to nominated environmental assets and potential protects. Natural resource management at the landscape scape requires land managers to work collaboratively with neighbours and other stakeholders–to look beyond the political constraints of tenure. A number of criteria were used to determine the strategic focus areas for Rangelands NRM at the landscape scale, acknowledging community interest and capacity, environmental assets, threatened species and communities, national and international interests, prior investment, productivity and the potential for sustainable rangelands management. These results were cross referenced against the 396 environmental assets that were identified as priorities during the 12 INFFER workshops held during 2011 and 2012. These workshops were held in every subregion and were attended by a total of 136 community and technical experts. This Regional Plan is not intended to be all-encompassing. The resulting priority area maps provide an indication of where we are currently focusing our effort. This Regional Plan is a living document; ongoing development is a participatory process. The Plan will be updated annually as more information comes to hand through proactive regional engagement and the nomination of environmental assets using the INFFER process. Program logics have been developed at the subregional level to ensure project development is undertaken in parallel the Rangelands Strategic Plan, which aims to protect, improve and manage the natural assets of the WA rangelands. The blue patches on the map (right) represent priority areas 2017-2022. 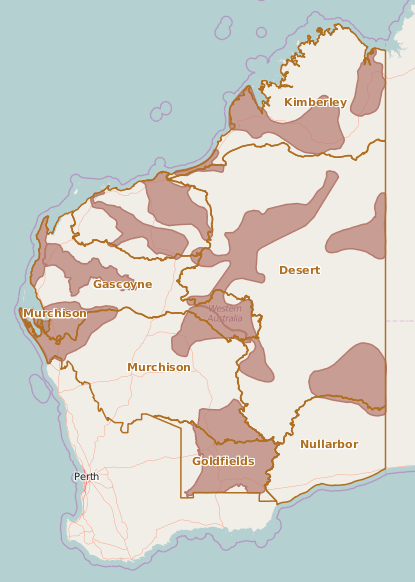 The diversity of land systems across the WA rangelands provides a variety of plant resources which are interdependent on regional and seasonal climatic conditions. Separating this climatic variability from management influences, as well as natural and human-induced fire, remains difficult in the rangelands. 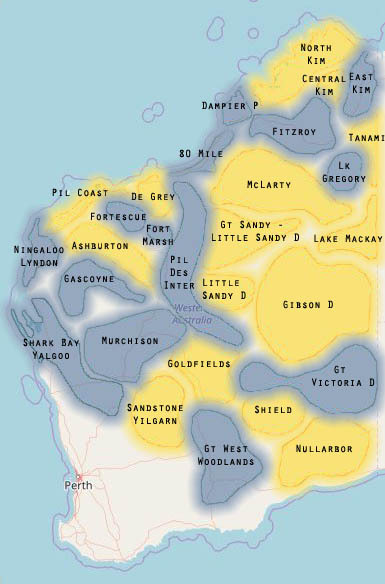 Highly productive land systems are a priority for investment and management in all subregions across the WA rangelands, independent of the identified priority areas. The pastoral value of land systems is based on their capacity to carry stock. Rangelands NRM aims to prioritise activities that protect, enhance or rehabilitate areas with the highest pastoral potential. These highly productive areas are generally a favourite for stock in the dryer seasons and typically include pastures on broad run-on areas and alluvial plains, footslope areas in the Breakaway (e.g in the Murchison) and fragile uplands (e.g. Chenopod shrublands) and some saline stoney plains. Managing total grazing pressure while maintaining species diversity and ecosystem resilience ensures that landscape processes are maintained. It should be noted that the implementation of projects is reliant on funding and that projects in the Priority Areas are not guaranteed to be funded.